Who wrote the book on werewolves? Most of us are familiar with the phrase, “S/he wrote the book on [the subject].” The case holds true for werewolves. People have, in fact, written the book on the subject—and not fiction. So, for #WerewolfWednesday, I bring you a compendium of such writings. 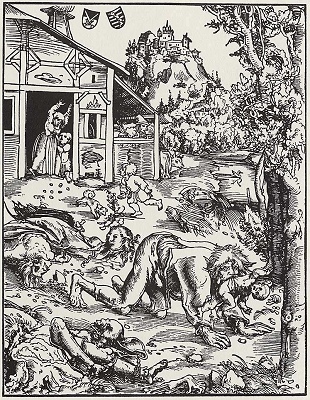 Here are a few notable examples, if you wish to learn more about the history and folklore of werewolves. The complete text of the book penned in 1865 in available at the link above. The author was Sabine Baring-Gould (1834-1924), who was a Vicar in the Church of England in Devon, an archaeologist, folklorist, historian and a prolific author. Baring-Gould was also a bit eccentric. He reputedly taught classes with a pet bat on his shoulder. He is best known for writing the hymn ‘Onward Christian Soldiers’. Prieur, Claude. Dialogue de la Lycanthropie: Ou transformation d’hommes en loups, vulgairement dits loups-garous, et si telle se peut faire. Louvain: J. Maes & P. Zangre, 1596. Wolfeshusius, Johannes Fridericus. De Lycanthropia: An vere illi, ut fama est, luporum & aliarum bestiarum formis induantur. Problema philosophicum pro sententia Joan. Bodini … adversus dissentaneas aliquorum opiniones noviter assertum… Leipzig: Typis Abrahami Lambergi, 1591. While Euro-centric, this time chronicles many tales and events of “werewolf” and “witchcraft panic” well. While this site isn’t a book, it chronicles many early tales and folklore. This site contains many early legends as well. Looking for fiction on the subject? Check out The Wolf at His Door!